I prostrate before the Goddesses, that they may bless us all with food for the body and for the soul, with courage to face all that life throws at us, with the wellbeing of our children and those of the future generations to come, with victory in setting uplifting goals as well as in achieving them, with prosperity in all its forms and with physical, mental, emotional and spiritual wealth for all. I wish a very Happy Navaratri to all my readers !! May the Goddesses cast their eyes on all of you! I had planned for some very interesting posts for this period but unfortunately my computer became sick and was hospitalised for the last ten days. As I am going to be away for the next two and a half months, my household responsibilities also reached mammoth proportions this week. Therefore I have chosen a very simple post for this occasion, a post I hope you will enjoy nonetheless. This version is from the CD – I strongly recommend it as a buy, it is excellent. For those who cannot link with the music server I use, you can download a slightly different version from Sangeethapriya here (free membership needed). It is Item 10 in this album. This version is not as good as the one in the CD but still beautiful. My prayers to the Goddesses for all! She (या) who is as dazzlingly white or fair (धवल) as a jasmine flower (कुन्द), the moon (इंदु) or a garland (हार ) of snow flakes (तुषार), She who wears white (शुभ्र) clothes (वस्त्र ), She whose hands (कर) are adorned (मण्डित) by Veena and a boon-giving (वर) staff (दण्ड), She whose seat (आसन) is a white lotus (श्वेत पद्म), She to whom Brahma, Achyuta (name for Krishna, form of Vishnu), Maheshwara (name of Shiva) always (सदा) worship/adore (वन्दित) from the beginning (प्रभृति), That (सा) Saraswati please protect (पातु) me (मां) and remove (अपह ) my endless (निःशेष) ignorance/apathy (जाड्य ). This beautiful prayer is written by Sage Agastya. Sage Agastya lived in the times of Lord Rama, in the Treta Yuga, about 5000 BCE. He was the author of the many hymns in the first mandala of the Rigveda, the most ancient and sacred of Hindu texts. The Aditya Hridayam, the prayer to the Sun God recited by Agastya to Lord Rama in the battlefield, is part of the Yuddha Kanda (Book 6) of Ramayana by Valmiki (500/400 BCE). Agastya is a very interesting and colourful character who is said to have been the first Aryan to have lead a group of migrants over the Vindhya mountains to the Dravidian South. He is mentioned both in Aryan literature and ancient Tamil (Dravidian) literature; in fact the Tamils have adopted Agastya as their own. His stories are told as far as Indonesia. The star Canopus is named Agastya in India. There is an interesting paper linking legends of Agastya with astronomy in this paper. 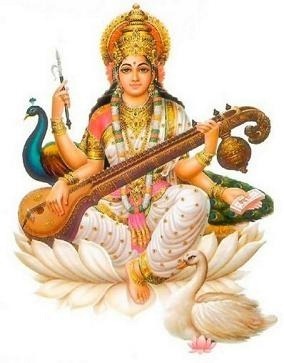 Each time we recite Ya Kundendu, which was written about 7000 years back, we not only pray to Goddess Saraswati but are in direct communion with our history, our ancestors from milleniums past. In this knowledge and information driven world, this prayer should be in your daily recitation list as well. Listen below for the pronunciation. 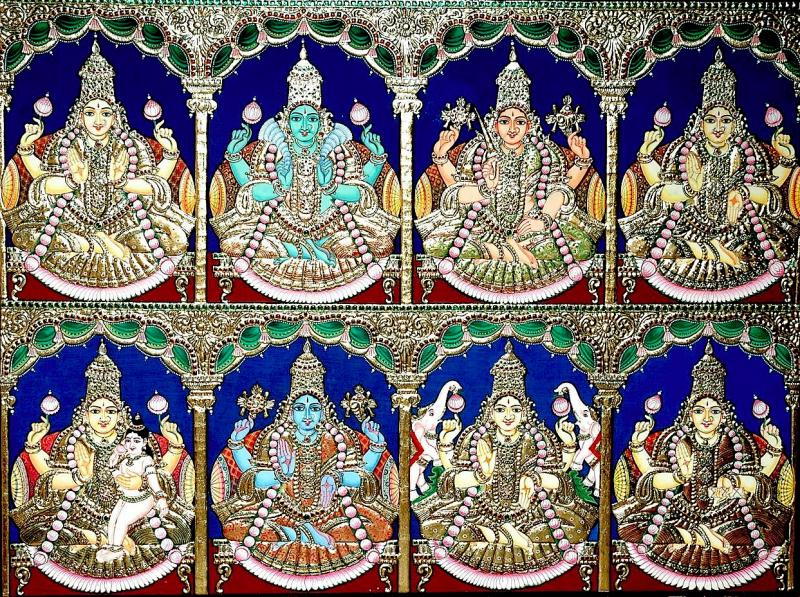 Today is sashti, the sixth day of Navaratri. 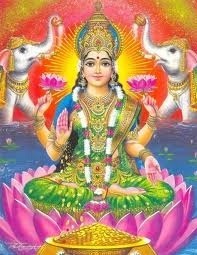 Following my South Indian heritage I continue my homage to Goddess Lakshmi today. We Hindus are so accepting of plurality in singularity and vice versa that I forget how alien the concept must seem to the rest of the world! We accept that the ultimate Brahman, has no form yet we are happy to worship God in innumerable forms. We invoke the same Gods by many names and sometimes in many forms. It is as if we can merge the many into one and see the one as many with no trouble at all!! How wonderful is that!! 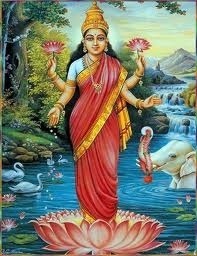 Aadi Lakshmi आदि लक्ष्मी The Primeval Lakshmi. Dhaanya Lakshmi धान्य लक्ष्मी The Lakshmi of Grain. Grain represents food here so it is She who is the provider of all sustenance. Dhairya Lakshmi धैर्य लक्ष्मी The Lakshmi of Courage. She who gives us the courage to succeed for such courage is worth its weight in gold. Gaja Lakshmi गज लक्ष्मी The Lakshmi of the Elephant. The elephant represents wealth in livestock. Santaana Lakshmi संतान लक्ष्मी The Lakshmi of the Progeny. She who provides us with the incomparable wealth of children. Vijaya Lakshmi विजय लक्ष्मी The Lakshmi of Victory. She who blesses us to succeed. 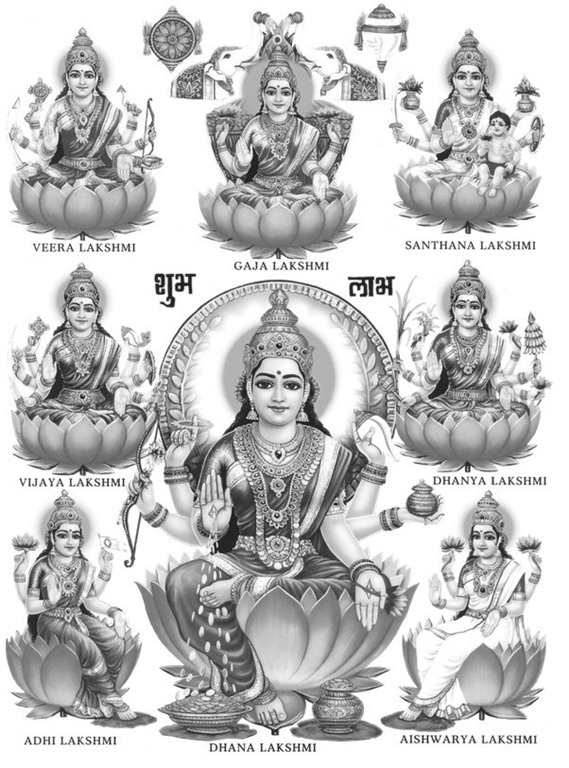 Vidyaa Lakshmi विद्या लक्ष्मी The Lakshmi of Knowledge. She who blesses us with the knowledge required to attain prosperity. 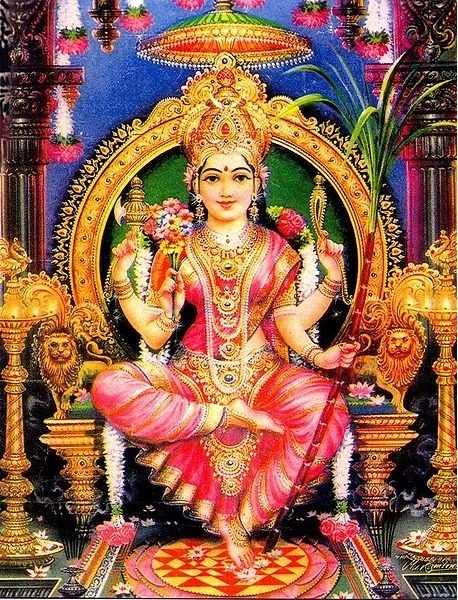 Dhana Lakshmi धन लक्ष्मी The Lakshmi of Wealth. She who blesses us with wealth. A very popular form for worship. Bombay Jayashri has sung the first verse of this stotram in her album Anubhavam. Listen below to Sumanasa Vandita in Raga Revati below. If you would like to know more about the raga, click here. Allternate link : Click here. To listen to the full stotram, click here. For transliterated lyrics and translation, click here. On this fifth day of Navaratri (Panchami), I continue to pay homage to Goddess Lakshmi. Those who pray to Goddess Lakshmi hope to be blessed with material wealth and prosperity. Even her image is shown as pouring gold from her hands. Here the poet-composer Muthuswami Dikshithar (1775-1835) describes Lakshmi herself as being golden (Hiranmayeeem); she is the gold that he aspires for. There is an interesting story behind this song. One day, it is said, Dikshithar’s wife longingly asked for some golden jewellery. Dikshithar was not in the financial situation to provide these for his wife. One of his disciples suggested to Dikshithar that if he were to go to the court and sing in praise of the king, the king would give him enough to buy some jewellery for his wife. Dikshithar refused and said that he would sing only in praise of his Goddess, never for a man! Then he created this beautiful composition, calling his Goddess the Golden One. That night, Diskhithar’s wife dreamt of the Goddess who came and poured gold on her and said, ‘there, are you satisfied?’. On waking up she apologized to Diskshithar for ever wanting any material wealth when they were so blessed with Divine wealth. For lyrics of this beautiful song, see footnote below. The song is set to Raga Lalita (see footnote). To enjoy this beautiful song, here’s a performance by the young vocalist Sikkil Gurucharan. For an instrumental version, listen to this beautiful performance on the Sax by the incomparable Kadri Gopalnath. Edit : A few years have passed since I wrote this post. There is a version which I admire tremendously and hear often. It is T.M.Krishna’s version which you can listen here. His pace is leisurely and deeply meditative. I love Lalita in all forms but like this she is just exquisite. Lalita is also lovely in the mellifluous voices of Ranjani and Gayatri which I also urge you to listen here. For transliterated lyrics, translation and notation click here. Lalita is a janya raga, derived from Mayamalavagowla (see below), 15th on the Melakarta scale. This is not related to the Hindustani Lalit. Nannu Brovu Lalita by Shyama Shastri is another composition in Lalita which I enjoy very much. Today, on the second day of Navaratri, I pay homage to Bhuvaneshvari, Supreme Goddess of the universe. I invoke the mystical mantra ह्रीं (Hreem) which is her Bija Mantra. How can a music blogger not acknowledge the power of sounds? Vedic thinking says that sounds have inherent strength and meaning, irrespective of the person who utters them. Mantras are such sacred sounds, with the power to transform, to shape, to influence. Mantras can be long or short, a detailed recital of qualities, a prayer, a plea, or a simple syllable. The most important are called Bija Mantras (Seed Mantras) which are just single-syllable immensely powerful sounds which exert their influence through sound vibrations. This idea is not limited to Hindu thought. The Christians believe that ‘In the beginning was the Word, and the Word was with God, and the Word was God’. That Word, that sound, we Hindus call Om. Who doesn’t know the power of the Bija Mantra ॐ (Om), also called the Pranava, which is the Bija Mantra for the supreme Brahman, the formless Supreme Being. The other important Bija Mantras are those of Shakti, whom we worship during these days of Navaratri. Dr. David Frawley says ‘Shakti Bija Mantras carry the great forces of Nature such as the energies of the Sun and Moon, electricity and magnetism, not simply as outer factors but as inner potentials of Divine light, love and wisdom. Shakti mantras hold, resonate, and propel the Kundalini force, the higher evolutionary power of consciousness, to flow within us’. For further information, read this. 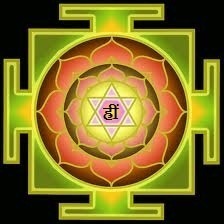 The Mantra ह्रीं (Hreem) is the prime mantra of the Great Goddess and invokes all her powers. This is associated with Solar energy and the power of illumination (real and metaphoric). It awakens our soul and connects us with the Divine. It has the power of removing mental illusions and makes us open to wisdom and truth. To invoke this Mantra, I present a song written by the Maestro Balamurali Krishna in a raga of his making, Lavangi. This raga is especially interesting because there are only four notes used (see footnote). The composition is small but powerful, just like a Bija Mantra. In the anupallavi, he refers to the Goddess as the form of Hreem(हृन्कार रूपिणी). For transliterated lyrics, see here. Listen to the Maestro singing his own composition below. It is amazing what he can do with only four notes! Lavangi is a janya raga, derived from Kanakangi (see below), 1st on the Melakarta scale. There is an interesting lecture-demo in English on this song by Prince Rama Varma. He also sings the chittaswarams which I had not heard before.